We support Carrier Billing or Payments using mobile/cellular operators. It is an alternative payment method which allows customers to pay for purchases directly on their phone bills instead of making payments with debit or credit card, cash or bank transfer. By integrating the Carrier Billing payment method, you can allow your customers to select the mobile billing option at the time of checkout and they need to follow a two-factor authentication procedure for secure payments. Before integrating any telecom billing partner, you need to enable Carrier Billing in your store. Carrier Billing will be enabled for your store and you can see it under Monetization menu. Note: Simultaneously, you cannot enable Carrier Billing and Payment Gateway for a store. 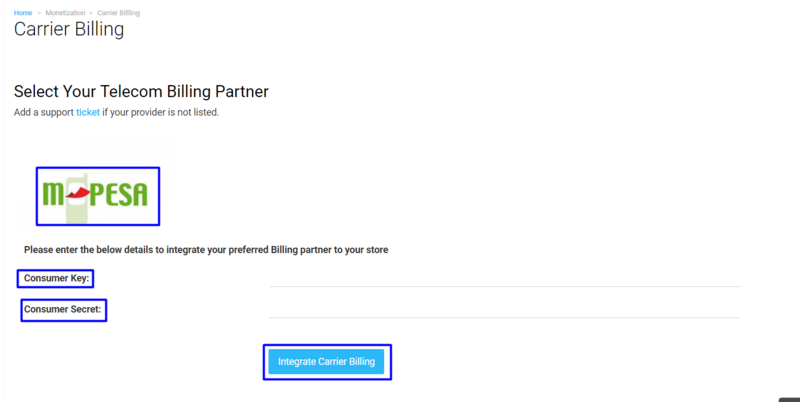 If you have already integrated Payment Gateway, then you need to add a support ticket to enable Carrier Billing for your store. Once Carrier Billing is enabled, you need to integrate a telecom billing partner to receive payment from your users. Let's add ideabiz. Note: We can add any Telecom Billing Partner for you, for an additional fee. Simply add a Support Ticket if you would like to add a specific Telecom Billing Partner.